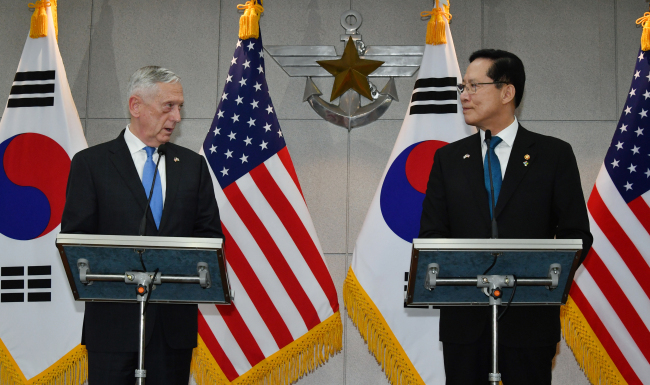 During their meeting in Seoul, Defense Minister Song Young-moo and his US counterpart James Mattis stressed that their decision to suspend scheduled joint military exercises will support diplomatic efforts to achieve the complete denuclearization of North Korea. Having visited Seoul as a part of his four-day trip to Asia, Mattis reassured that the US will maintain the current level of its troops stationed in South Korea, countering jitters over the possible drawdown amid unprecedented detente on the Korean Peninsula. “US commitment to the Republic of Korea remains ironclad and the US will continue to use a full range of diplomatic and military capabilities to uphold this commitment,” said Mattis during his opening remark before the meeting. The closed-door meeting, which lasted more than an hour, came at a critical juncture. South Korea and the US are seeking to engage with North Korea, but concern persists such diplomatic overture would undermine the readiness posture. Following his historic summit with North Korea’s leader Kim Jong-un on April 27, US President Donald Trump stunned the allies by announcing that he will suspend what he called a “provocative and expensive” joint military drill with South Korea. Trump’s remark was followed up with a series of decisions to suspend scheduled military exercise, including Ulchi Freedom Guardian exercise slated for August and Korea Marine Exercise Program scheduled in a few months. “The recent decision to suspend the Freedom Guardian exercise creates increased opportunity for our diplomats to negotiate, increasing the prospects for a peaceful solution on the Korean Peninsula,” said Mattis. During the meeting, the two leaders agreed that they will consider denuclearization of North Korea and readiness posture of the allies, when they decide to adjust the scope, timing and scale of the combined exercise, Seoul’s defense ministry said. While the combined exercises can be rescheduled or dialed down, South Korea’s own military exercise will be proceeded -- unless they cause “needless provocations” toward North Korea, a military official told reporters under the condition of anonymity. The comment came amid the speculation that the South Korean military consider halting artillery exercise near the border island in the West Sea. Employing K9 self-propelled howitzers, the military has conducted live-fire drill annually. “There are various ways to adjust the exercise. We can carry out the exercise without notifying the public or conduct computer-simulated exercises … It is more about refraining from provocative exercise,” the official said. Song said if North Korea keeps its denuclearization pledge and follows up with specific implementation, the allies will seek more steps to enhance mutual trust with North Korea amid animosity that has lingered since the 1950-53 Korean War ended in an armistice, not a treaty. “Now we are at a turning point to leave behind the dark history of confrontation and standoff and open up a new era of peace and cooperation. ... It’s such an important opportunity created by President Moon and President Trump. Meanwhile, Mattis’ scheduled meeting with Moon was canceled as the president cleared his entire schedule for the remainder of the week, Cheong Wa Dae said. The president has reportedly caught the flu following his trip to Russia last week. The meeting followed Mattis’ visit to China, the first stop on his four-day Asia trip. He spent three days in China to meet with Chinese leader Xi Jinping, who has reportedly told Mattis that China will not give up “any inch of territory” in the Pacific Ocean. After meeting with Song, Mattis headed to Osan Air Base for his flight to Japan. He is expected to meet with his Japanese counterpart Itsunori Onodera, where the conversation will include Japanese concerns of the threat posed by North Korean’s short- and medium-range missiles.